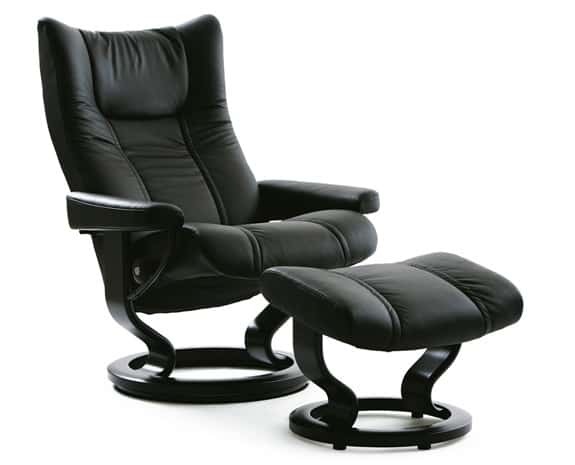 In 1994, the Stressless Wing (L) recliner entered the market and remains one of the most popular Stressless designs today. The Wing (L) appeals to a wide range of classic styles with it’s luxurious, modern design. With advanced ergonomic technology and design, this chair will support your body at all angles where it needs it most. Plush cushions, padded armrests, and sculpted proportions deliver unprecedented comfort at every angle. Patented technologies work for you beneath the surface to adjust comfort and support according to your body’s position. A durable 360 swivel and sturdy base allow you to change your view with ease. This polished recliner is an essential piece for any home. The Wing (L) is perfectly suited for individuals of larger size and statue. Advanced ergonomic technology responds to your body’s movements by adjusting proper support for your back and neck. Twirl with ease and adjust your view thanks to the 360 swivel and sturdy base. 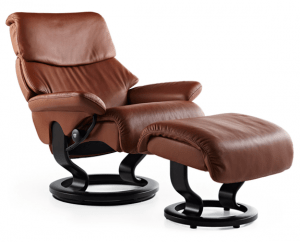 Stressless recliners are built with high-quality parts and materials that are built to last for many years of regular use. You’ll love the modern design and comfort you’ll experience with the Wing (L). Kick back and relax knowing that when you choose Stressless, you’re taking care of your long-term health with a chair meticulously designed with you in mind. We ship to any address in all 50 United States. Ask for details regarding shipments to Canada. For quality assurance, all Wing (L) shipments must be insured for accident, loss, or damage. Once your shipment leaves our facility, a tracking number is provided via email. Unless otherwise stated, delivery means “to your door”. Shipments must be signed for by someone over 18 years of age.